Marketing comes in many forms. But, there’s no better way to capitalize on marketing than through your customers. Word of mouth is one of the most beneficial marketing channels for businesses large and small for many reasons. It’s cost-effective. Even if you’re offering cash incentives or discounts for referrals, it’s still one of the cheapest forms of marketing there is. It’s effortless. Satisfied customers will be happy to recommend your services to others. The monetary incentive just acts as an additional motivating factor to prompt them to remember. It’s replicable. Once you’ve formalized the process, it’s relatively simple to maintain. There are many customer referral programs such as ReferralCandy or Referral Saasquatch that make it easy to generate new leads. The trick with referrals is to get in the habit of asking. The more people you ask, the more chance of word getting out about your business. And, the better you target your incentive programs to meet the needs of your customers, the more you can increase the chances of them working for you. Here are some of the best ways to incentivize your customers and make the most of this rewarding marketing option. Offer money off their next order. While you don’t want to be cutting into your profit margin, offering a small amount off their next order can act as a significant incentive for people to refer you. Not only will customers come back and use their discount, but you will also be able to gain a few new prospects as well. The trick is to make the process as simple as possible. If the referral process is overly complicated, it will turn people off very quickly. No one wants to jump through too many hoops for 10% off. Even a simple social media share can be incentivized making those marketing dollars go further. Who doesn’t love to win something free? Give your customers the opportunity to go into a drawing or contest with the chance to win something that holds value for all who enter. The entry fee can simply be a customer referral. The more people they refer, the more chances they have to win. It’s a great way to encourage people to spread the love, and winning is the icing on the cake. Point systems are used in many areas of marketing. Each referral would give your customer a specific number of points which they could then cash in for gift cards, products or services. Gamification is a fun way to allow customers to refer your business. Using points, levels, badges or goals can keep them motivated while giving them control. Reward them with promotional merchandise. Promotional merchandise (or SWAG) is the gift that keeps on working for you. Remember, however, if you do wish to create swag to send to your customers, make sure it is something they will want or use. You can have too many stress balls or coffee mugs, so make it count if you want your customers to be happy with their branded products. A branded t-shirt is an easy way to make customers feel special AND to encourage more brand awareness. Giving a gift for referrals is a great way to acknowledge their efforts and your appreciation. A gift card or a bunch of flowers work well, particularly if it is an unexpected surprise. 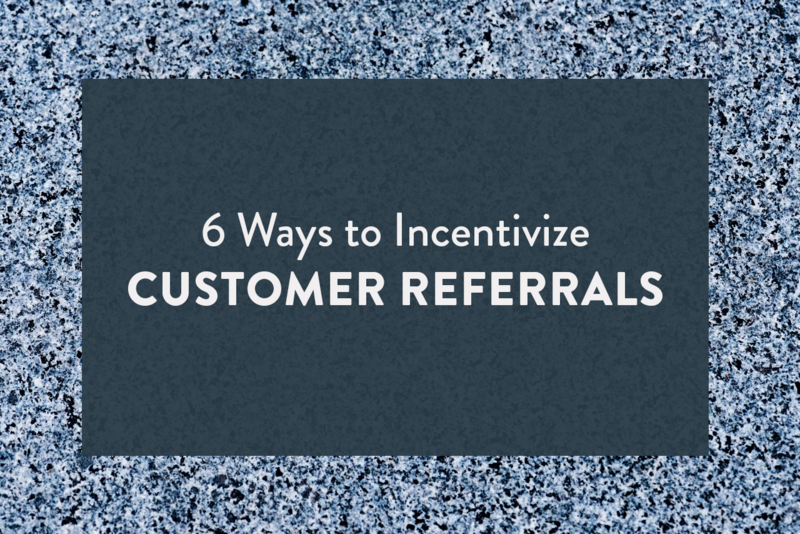 While it may not necessarily incentivize their first referral unless you have formalized the process, it may help to prompt them a second or third time. Customers love to feel appreciated, and this method of incentive requires very little work from your customer in order to get rewarded. It may be worth trialing a few methods and comparing the results to see what is the best fit for your organization. It may not always be necessary to incentivize your customers. Sometimes just providing excellent customer service and asking them to refer or share can be beneficial, too. Either way, you are developing great press by tapping into your past customers and guaranteeing that you stay in their memory should they ever need you again and creating new prospective customers in the process.